As I think back on my career and recall the times I had the best work experiences—where I was connected and engaged the most—it almost always involved a crisis or a pressure-filled project. I can vividly remember working on a big Chrysler account or a huge GM Parts incentive program. We worked 24/7 for weeks. In one case, we slept in the office in order to meet deadlines. We visited the printer at 3:00 am to proof the printed pieces for the presentation while the first run was still on the roller because we didn’t want to waste the 4 hours until they could deliver the proof to the office. We were under tremendous pressure and we released that pressure the minute the job was done at a local tavern on the way to the employee parking garage. We were a team with a mission. A mission that required sacrifice and hardship. And the funny part was that from then on, regardless of the situation, we were still a team. I’m still in contact with those people 20+ years later even though we work in different industries and in different places. Many of you with military experiences have similar feelings based on the team you were with during your tours of duty. Please don’t put words in my post—I’m not in any way drawing a parallel between military service and putting together a presentation for the suites at a major automotive manufacturer. You win that one, boys and girls. And, thank you. The point I’m making is that many times (almost every time) a team under pressure to achieve a goal becomes a strong, connected, and engaged team. So why not wag the dog to drive engagement? 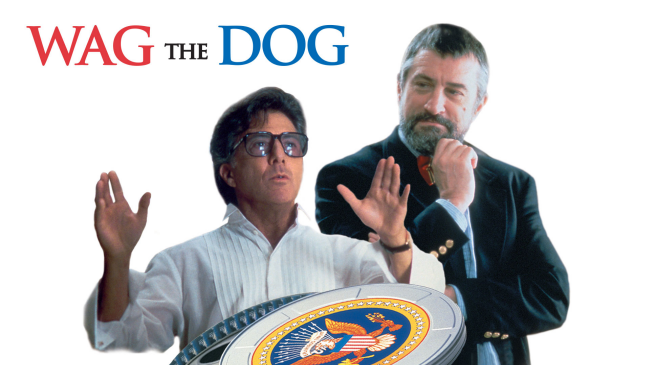 Wag the Dog was a movie from 1997 about the President of the United States. After being caught in a scandalous situation days before the election, he manufactures a fake war in Albania which he can then win in hopes of driving his numbers up and ensuring his reelection. In other words, they created a fake situation to engage the population. So I ask if putting people into high-pressure situations helps with employee engagement, should managers look for situations to amp up the heat to help the team coalesce and become more engaged? Should we subtly put more faux pressure on projects to help create more engaged teams? Full disclosure: I’ve never done this myself, but I would think that having specific projects that new team members could participate in—designed to be pressure-filled and manic—might be a great training process to create connections early in a career. What say you? Too much real work going on to manufacture projects? Or, even if you have real work that you can put a little extra zip on, do you think that duplicitous? Ask yourself… Would you wag the dog if you could?